This little movie staring Jimeoin (Fergus) and Alan McKee (Wesley) is a feel good little tale about two Irish lads who are on the run from troubles back in the old country with a thug called Colin who had contacts with organised crime. They've come to Australia for a better life and also to wait until the heat dies down back in Ireland. When their visas run out, Immigration is on to them and so the boys start to make their way up the coast from Sydney to Queensland. Along the way they find love, pick melons and unfortunately Colin has wound up in Australia on a witness protection program with two members of the SAS. After realising that the guys are in the country, Colin points them out to the SAS as terrorists from the old country and then escapes, hunting down our guys himself. This is a fun little ditty that doesn't seem to take itself too seriously. There are moments in which the guys seem to be in a bit of a jam however they get out of it most of the time. I enjoyed this flick however I'd have to say that it certainly isn't a blockbuster by any stretch of the imagination, it's just a good piece of entertainment. 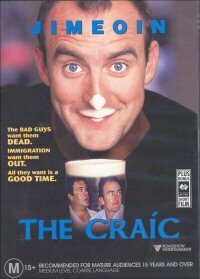 The Craic means a bloody good time and you'll have one with this DVD. The perfect flick to rent out with a couple of mates or a girlfriend to sit back and enjoy. It wasn't quite the ending that I had hoped for but nonetheless, a good view. Recommended. This movie looks good in 16:9 and there are no problems from what I can see with any of the visuals in this film. The film is in Dolby Digital 5.1 and whilst sounding good doesn't really do much with a complete setup. The audio is clear and in sync with the film and the soundtrack itself is completely serviceable and in line with the feel of the flick perfectly. As far as extras go there's only a theatrical trailer there and there is also a short film from the Australian Film, Television and Radio School which I am not going to cover in this review as it has no bearing on the main feature, nor does it enhance or add to the overall viewing experience.